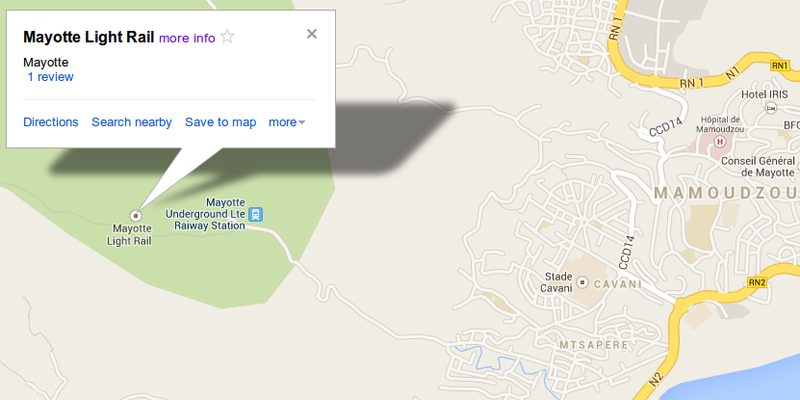 Google Maps shows "Mayotte Light Rail" and "Mayotte Underground Lte Raiway Station" (sic) near Mamoudzou, in Mayotte. On the other hand, Wikipedia says there are no railways at all on the island. Which one is true? If there any railway, can it be used for person transport, with what stations? It's fairly straight-forward to rule it out. A quick few Google searches shows absolutely zero mention of trains / rail in the country. Aside from Wikipedia mentioning the lack of rail. That indication of it on the map being misspelt may indicate a vandalised submission gone wrong. We can't be sure, but it's another strike. The map you load? Turn on satellite view. It's a house in the middle of nowhere. No station, nothing. For an island in the middle of the ocean with one airport, if you're going to have a train station, it's not going to be out in the country alone. Sure it's called 'underground' so no track might be visible. However, if there is track, it would have to go to another station - and none can be found anywhere in the area. This is agreed by with the one review of the location, which is basically mocking the information: "Un métro à Mayotte ? Avec une station en pleine forêt dans une zone complètement inhabitée ! Vous allez les chercher où vos informations ?" - (excuse my poor translation, but roughly "A metro in Mayotte? With a station in the middle of an uninhabited forest area? Where do you get your information?). From this, one can safely conclude - there's no metro, and it's simply been filed/labelled in error. Nice find though! First you probably noticed the only review, mentioning it is a desert place. Also, we can look at OpenStreetMap and see that there is most likely nothing, even though the track that arrives at that point is better shown in Google Maps satellite view (and we cannot see any trace of railway on this view). A google search gives a unique result that seems to just parse information from Google Maps. So to summarize, I suppose some wrong information was filled in Google Maps, there is likely no railway (even underground as Google Maps suggests) in this area. Not the answer you're looking for? Browse other questions tagged trains mayotte or ask your own question. Is the connection between Ueno station on Keisei line and Ginza line in Tokyo internal? What is the relation between Lille Europe and Lille Flandres railway stations? Does South Korea have trains from Andong to Jeonju?